It was an absolutely fun year of running for myself and Braden, as he developed into quite the athlete while I tried my best to be a good mentor and running partner to him. There has been so much that has transpired from the previous year. Last year, Braden started getting into running as a 6-year-old when he ran his first 5K and 10K races. 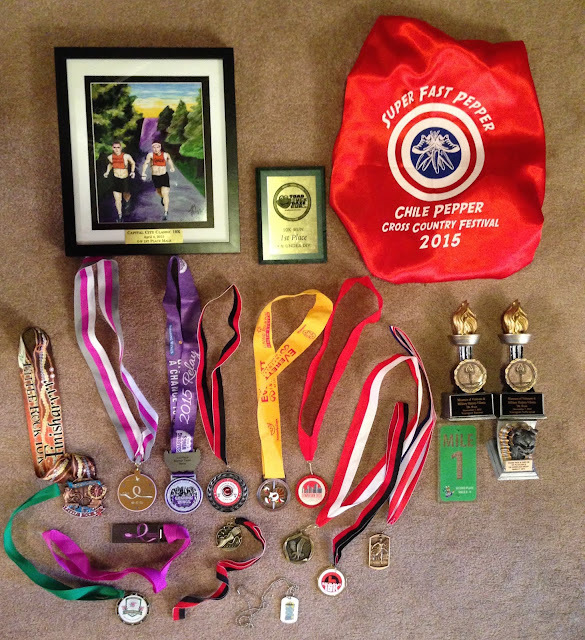 In 2014, he ended up running (4) 5K races and (1) 10K for a total of 5 races with a combined distance of 18.6 miles ran. Needless to say, he ramped up his running to whole other level in 2015! Before getting to some highlights, I just want to write about the running adventures we've started and developed this past year (this is where I get all emotional while typing everything!). 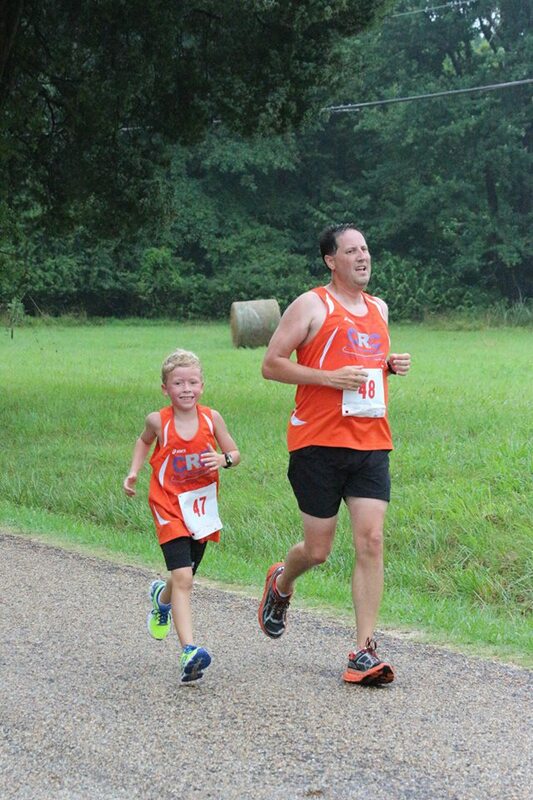 Braden's year started as a 6-year-old with our first race at the Little Rock Marathon 10K in March. We had trained all winter in preparation for the race and a week before the race, Braden got strep throat. The doctor was very pessimistic about him running, but Braden was not going to let that deter him after training for so long in preparing for the race. On race day, he got sick at mile 4 and I came really close to pulling him off the course. He would have none of that though...he didn't want to quit and was determined to finish. Even though he didn't have a good race time, he finished first in his age group. It was at this race that I saw the competitiveness and drive he had to finish and succeed. 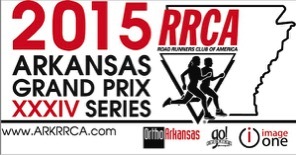 After the Little Rock race, I discovered the opportunity to have us run in the Arkansas Grand Prix. In order to run in the Grand Prix, though, you have to belong to one of the many running clubs that are throughout the state. 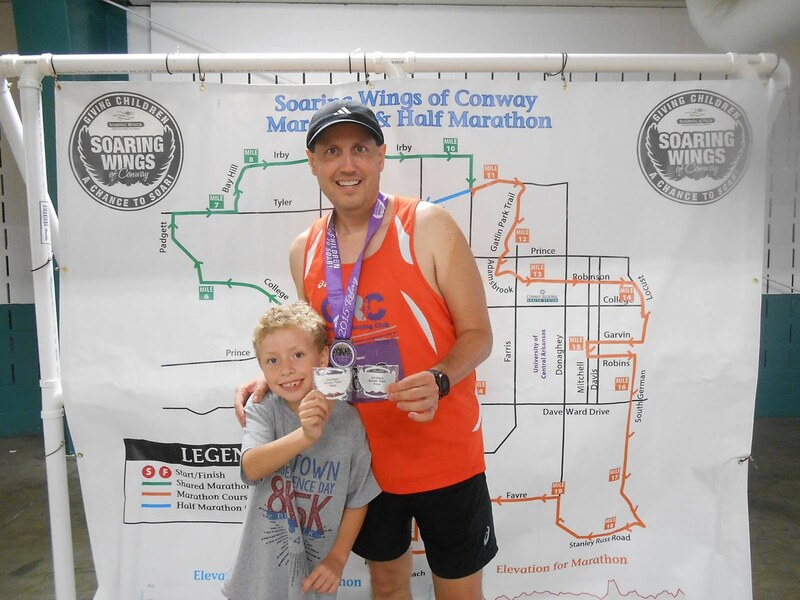 Naturally, we were drawn to the Conway Running Club due to its proximity to Vilonia. We have developed so many friendships with those in our running club and we (when we are able) love to go to the meetings. The great thing about Grand Prix races is seeing runners from around the state frequently, which means even more friendships as well. There are so many times that I feel I'm just tagging along since Braden is the more well known of this father-son duo, but I don't mind at all! Braden missed the first three races on the Grand Prix schedule, but it didn't take him long to catch up. The Grand Prix races are made up of several different distances and are divided up into championship and non-championship categories. The championship races are worth up to 30 points and the non-championship up to 20 points. There were a couple of Grand Prix races where he didn't finish first in his age group, but in those races he did come in first amongst those who were Grand Prix participants. Overall he scored maximum points for all his Grand Prix races and totaled 250 points for the year. For this accomplishment, he'll be recognized in February 2016 at the Grand Prix Awards Ceremony. The Grand Prix definitely made his competitive juices flow, and more than any of the other races he ran (other than USA Track & Field), he was more amped and focused for the Grand Prix ones. At our third Grand Prix race of the year, the Capital City Classic 10K, Braden's "running career" took another twist. At the finish of the race, after setting a new PR, there was a gentleman who came up to me and asked how old Braden was. After I told him Braden's age, the person gave me his card and asked me to give him a call. That person was Coach Cezar Terlea of the Arkansas Performance Running Club Patriots, a USA Track & Field club based in Little Rock. At first I was skeptical and had to make a few phone calls to my Conway Running Club friends to see if Coach Terlea was legit. After receiving some very positive feedback, I started taking Braden to the University of Arkansas - Little Rock track every week. Ever since he's been running for the Patriots, he rarely misses a week where he doesn't practice. 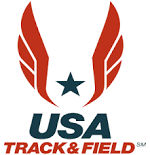 The Grand Prix races and USATF track events have really complimented each other well, with the distance racing helping his stamina in USATF and the speed from track helping in his road races. Coach Terlea, who is also the head cross country coach at Central Baptist College in Conway, has always been positive with Braden in teaching him to be more efficient, proper running techniques and ways to get faster. What makes USATF events more challenging to Braden is that he needs to sustain higher speeds for shorter "long distance" runs. USATF divides their age groups into two-year brackets, so this year Braden was in the lower age of the 7-8 age group. He did really well his first year by qualifying for the Outdoor Track & Field Nationals in the 1500 meter and the Cross Country Nationals in the 2K. We took him to Albuquerque, New Mexico for the Cross Country Nationals, where he got a true taste of running against the elite runners from around the nation. Even though he didn't finish where he wanted, it was a great experience and it made him more determined to put in the work on the track to improve and get faster. Braden strives to excel in everything he does. He's a straight "A" student at school, where his teacher says he's very competitive in his schoolwork and he is goal-oriented, which is unusual for a kid his age. We always set goals for our races and even though I have to sometimes tell Braden he needs to be a little realistic on what he wants to do; for the most part he is successful. We say a prayer before every race asking the Lord to give us the strength mentally and physically to succeed and to thank Him for being able utilize the talent's He's given us. After that, Braden's aim is to win! He gets a thrill when he's able to meet his goals and I love being able to celebrate with him when he does. When you have a kid as driven as Braden, the goals tend to be pretty easy. Prior to a race, we always lay out what he wants to accomplish. The first is to win in his age group, the second (if it's a Grand Prix race) is to get maximum points, third is to set a PR, and last is to get a high age-grading percentage. What is age-grading percentage? To me it is one of the best measurements of where a runner truly stands with their perfomance. I first saw these percentages on Mac's Race Timing Service's searchable results from one of our races and from there started researching about the meaning and application of the program. The optimal age for runners is between the ages of 19-30...basically their prime. Because youth is on their side, on any given race, the top runners tend to be between those ages and will put up the fastest times. Anyone who falls outside of the prime age group (generally younger runners like Braden and older runners like me who are 40 and up) are at a disadvantage to the 19-30s due to not yet being fast enough or slowing down due to getting older. This is where age-grading plays a part. There are programs that will calculate a younger or older runner's result based on age, distance, track/road, and time. The result will give what the person would have timed if they would have been in their prime. 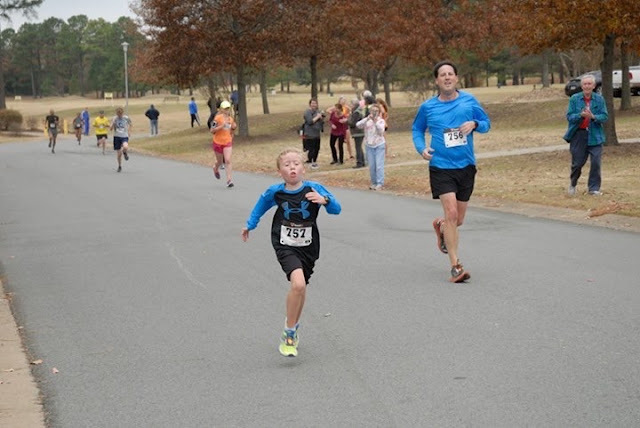 For example (shown below), Braden ran his best 10K in 47:39 and, plugging in the numbers, it basically shows that giving the same effort as a 7-year-old, he would have ran a 33:49 time as a 19-year-old. The last number that is given is an age-performance percentage. The higher the percentage, the higher class of athlete you are. For an example, if your percentage is in the 60+ range, you are deemed a local class runner, 70 + is a regional class runner, 80+ is a national class runner, 90+ is world class, and lastly, 100+ is world record level. On my best efforts I tend to fall in the high 50s to low 60s. Braden, though, is on a totally different level. At the beginning of the year he was mainly in the mid to high 60s, but ever since he's been running track, his percentages have been mostly in the 70s. For his 10K PR race, he had his best run ever, performance-wise, with a percentage of 79.01%, which puts him on the cusp of being a national class runner for his age. His 5K PR of 23:32 gave him a performance percentage of 77.68%. Along with Braden's goals, he has big dreams as well. I don't want him to grow up so fast, but he is already looking forward to running track and cross country for Vilonia. Vilonia has one of the top running programs in Class 5A and they are led by Coach John Allison, who leads the cross country team, and Coach Michael Stout, who leads the track team. They both know Braden very well! There are not too many kids who like to watch track, but Braden loves seeing the older kids in action and he has already informed me that one day he is going to own all the distance records for the school. At the Fly Like an Eagle 5K, he got the chance to run with the owner of nearly all the long distance records at Vilonia, Zach Rail. Even though he was sick during the week, Braden was determined to run the race. He finished...barely, but it was at that race where he met a lot of the cross country kids and Coach Allison. Coach Allison and Stout are outstanding individuals who really have the best interest of the kids they coach and it is my hope that both of these men will still be coaching when Braden gets older. Lastly, to my chagrin, he wants to run for the Arkansas Razorbacks. Anyone who knows me knows that I'm a Texas A&M fan and I don't care for the Hogs, but I told Braden that if he had the opportunity to run for Arkansas, I would Woo Pig Sooie him around the track! Even I know how great Arkansas' track and cross country programs are. I use the age-graded calculator to tell Braden the performance percentage he needs to get, in order to get a scholarship and run for a great team like the Razorbacks. He knows all the hard running (along with academics) he'll be doing over the next several years is for a scholarship and to get into the best school he can. Once again big dreams!! Like most runners, Braden has had times where things didn't go quite as well. There are times he hates to train and some of his races haven't been as good because of it and for a time period in the late summer, it seemed tortuous to get him to try to get a 5K training run out of him, especially when we were having to train for 10Ks. I discovered he needed some changes in scenery and was getting bored of the same route we had been running. Usually, though, he's had bad races due to illness. He had strep three times and had the stomach bug a couple of more times which affected his performance. He did throw up on the course a few times at the finish, but that was because he pushed himself really hard at the end. Overall, I believe he's left his "mark" at the race course at least 7 times. One of the privileges and best parts about running races is getting to do them with Braden. There are no other sports I can think of where I can actually participate and take part in my son's accomplishments...I get such a thrill! I really thought that it would take Braden a few more years before he would seriously challenge me in a road race, but he has made such huge strides, I've found that I need to be on top of my game in order to keep up with him, especially with the killer finishing kick he possesses! More than anything, I believe he relishes the challenge to beat me (and talking trash!). His first race where he accomplished this was the Watermelon 5K, where I had an extremely bad race and the excuses to go along with it, but at the Breakaway 10K I ran close to my PR and he still beat me! I've had ups and downs with my running ever since I started in 2011. During that time frame I've had many successes focusing mainly on half marathon and marathon events, but I've also had some bad setbacks which were attibuted to injuries. Running with Braden has sparked a renewed interest for me and I know that I need to continue to get into better shape and strengthen my game because it won't be long before the only time I'll see him is at the start and finish lines, where he'll be waiting on me! One of my biggest highlights of the year was when we ran in the Soaring Wings Half Marathon Relay. The relay provided us with an opportunity to run as a team and what made it even better was when we were able to place in the top three. I love to talk running and, more than anything, I love to talk about Braden's running! I know it's the proud father in me, but I truly thank the Lord every day for the blessings and abilities he's given to Braden. Braden has an amazing support group and I always show him comments on Facebook and let him know when someone gives a word of encouragement. I have had so much fun starting up this blog and it allows me to give him a record of what he has done so he can look back many years from now to see where he's progressed. So what do we have to look forward to in 2016? Braden has mentioned that he wants to win the Grand Prix again, set more PRs, and after his finish at the National Junior Olympic Cross Country Championships, he said wants to work harder on the track to improve his speed to be more competitive on a national level. This next year, he will be traveling all around Arkansas again while also going to Kansas, and hopefully Sacramento, California and Birmingham, Alabama for USATF. We are also in training for his longest race yet...the River Trail 15K in February. Now for the sad part...for me. I will be deploying this upcoming year and my last race with Braden will most likely be in early April. It's going to kill me not being able to run with and see him continuing to get better and better. Once again, he has support that will be there with him while I'm gone. Thankfully, his papa Bernie will join the Grand Prix after running a lot of the races this past year and even though he can't keep up with Braden, he'll at least be able handle the logistics of taking him to most of the races and being there for him. His uncle Greg has graciously accepted the role of running with him for his weekly long distance runs. This was my biggest concern since he has gotten so much faster. I didn't want his times to suffer because no one could train with him, so my brother has the huge responsibility of coaching him while I'm not here. Also, since Coach Terlea will be coaching in Conway, it will enable Braden to run track in Conway instead of having to get toted down to Little Rock all the time. One thing is for sure...even though I won't be here, I will still be able to keep close tabs on his races and continue to write the blog. Well, that will do it for 2015 and Braden and I would once again like to thank everyone for their support and friendship...it truly means a lot to us!!! Our next race will be on January 24, where we will have the first Grand Prix race of the year...the One Hour Track Run in Pottsville, Arkansas. This championship race will be a flat course and there will be water stops every 1/4 mile...because it's a track! The winner is whoever runs the most laps (furthest distance) in one hour.